Share Your Tip Try our new form! Tips selected for publication are eligible for one of our contests, which award $50 to the best tip. Our current contests are: Cleaning Tips, Craft Tips, Food Tips, Gardening Tips, Celebration Tips, Organizing Tips, and Thrifty Tips. We are looking for original and unique unpublished content. Your tip must be written by you and photos must be taken by you. Tips with a photo and can also increase your chances of winning the contest! Rewards are sent by email using Paypal or Amazon Gift Cards. You can also choose to donate your Rewards to charity. Publishing decisions are made by the ThriftyFun editors, based on the needs of the site. Some tips or photos may not be selected for publication or may be moved to a more appropriate contest. Tips may be edited for clarity, at the discretion of our editors. Proper spelling, punctuation, and spelling will increase your chances of being selected for publication. At the completion of the contest, we award a $50 prize to the best tip in each contest, as chosen by our editors. While the winning tip is ultimately an editorial decision, the popularity of the tip and the number of thumbs ups on ThriftyFun, likes on Facebook, pins on Pinterest and success on other social network sites factor into our decision. 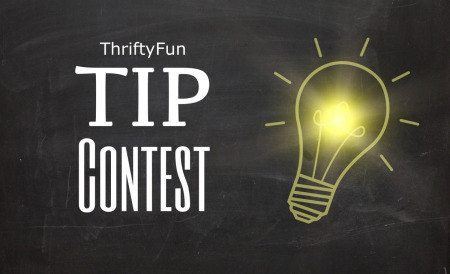 The goal of our contests is to gather as much useful information as possible to share with the ThriftyFun community. By submitting a contest entry, you are giving ThriftyFun permission to publish the submission. Submissions can be edited, combined or moved to a different contest, as determined by our editorial staff. We are looking for original and unique unpublished content. Exceptions may be made for personal blogs, at the editor's discretion. All text, including step by step instructions must be written by you and include your own personal photos. Submitting copyrighted material is prohibited. This includes images found on Pinterest, Facebook or other social networking sites. If a qualifying submission is selected for publication and is eligible for rewards, we will send you payment via email (Amazon or PayPal) in amounts stated on the contest page at the time that you enter the contest. Non-US Residents:If you live outside the U.S., you must have a PayPal account in order to receive payments. Only U.S. residents can redeem our Amazon gift cards. At the time of entering your contest entry, you will be prompted to review your payment preferences. Please double check that your email is correct for the payment option you choose. If any contest doesn't receive the minimum number of submissions (10), the contest will be extended for an additional month. No spam or self promotion please, just useful information. Don't submit the same information more than once, or in more than one category. The more you personalize your entry, the better. Ideas that have been previously published on ThriftyFun are less likely to be posted than original ideas. Multiple submissions in the same week may result in short delays in publishing. Links to other sites are not eligible to win contests. If you'd like to share a link to an interesting site or idea, just submit the link with an explanation of why you think it would be valuable to our community. Limit your submission to no more than 5 per day. Not every contest submission is selected for publication. You will receive an email when your submission is published so you can share it on social networking sites and encourage your friends and family to rate or comment on it. Our editors make the final decision on the winning entries. Generated 2019/04/26 01:44:26 in 78 msecs.